Are you looking for some MORE fun St Patrick's Day ideas? If so, I hope you've checked out my St Patricks Day pinterest board. I've collected some fun ideas that are a pretty easy way to spice up the holiday for your kids. Probably the most repinned idea (197 repins!) on my board is this Leprechaun Hat Cupcake Wrap by Linette of Kids Fun Reviewed. She posted the easy cupcake wrapper direction HERE over on Amazing Moms. What a quick, easy, and spectacular cupcake idea. 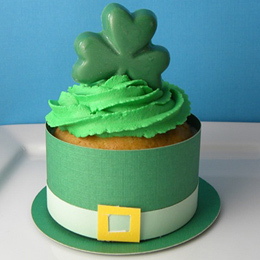 Be sure to go check out the template and instructions for these St Patricks Day cupcakes. And don't forget to pin it! You've got such great stuff here. I'm your newest follower.